Another Nigel Slater recipe that I already did for our Swiss Day dinner which we’ve had almost every week since then. 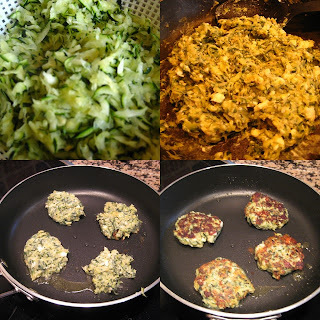 It’s a new and delicious way to have zucchini (courgettes) and really easy to make. Last night, we had it for dinner with a pan-fried fillet steak and a baked potato. plain flour – 3 Tbsp. Feta cheese – 100 gr. Coarsely grate the zucchini in a colander, sprinkle lightly with salt and leave in the sink for half an our or so. Chop the onions finely and warm them gently with a little oil in a shallow pan. They should soften but not colour. Pat the zucchini dry with kitchen paper or wring them out lightly with your hands. Peel and chop the garlic and stir into the onions with the zucchini. When all is soft and starting to turn pale gold, stir in the flour and continue cooking for a couple of minutes or so, with the occasional stir, to cook the flour. Beat the egg lightly and stir into the onion mixture, then crumble in the cheese and the chopped dill. Season with black pepper and a little salt. Heat three tablespoons oil in a shallow pan, drop heaped tablespoons of the mixture in the hot oil and let them cook until they are golden on the underside. Turn carefully – they will be fragile – and cook the other side. Lift the cakes out with a spatula and drain briefly on kitchen paper. Serve with the chutney. Makes about 6. (*I make them slightly smaller and stretch them out to 8) .